Keep fighting the good fight in 2018! A Cocktail of Corruption in America? Insurance companies are calling the shots in America now, bleeding the system and making even more blood flow progressively in the hospitals here. It is not just happening in Russia. (See articles below.) If you want medication in Russia often times you must buy it yourself! You cannot wait for the state or the insurance company! That is a socialized medicine that was once essentially free? In the state-run institutions of today, physicians are paid by the same as in Soviet times. Pensions and salaries frozen in time at a few hundred dollars. Insurers are involve now and everyone must play games to survive in the shadows.) The government run institutions pay physicians a few hundred dollars a month and expects them to live on it. Increases in military spending cut plans to increase healthcare spending and physicians pay in Russia. Do you see where this vicious cycle is heading. Can one see the parallels here? Physician pay has not kept pace with tech, corporate positions or banking specialists as an example. In America with prior-authorization, Choosing Wisely, and mail order mandates, etc., it is becoming almost the same here when you need attention immediately. Tests and labs are requiring the same red tape in advance. A patient that direly needs admitting or observation does not get either. One cannot work for the patient anymore. Instead of the hallways, the patients lie in bed at home. In a clinic, one can care for only half the number of patients as before. Patient care is truncated by deep red tape and endless bureaucratic click-clerk mandates. Who invented these war-period rationing tactics and countless 'bureaucratic atrocities' and why? Do we need a prior-authorization to think for ourselves and see the truth. The rich elites and their crazed political shakers in control of most of the world do not care one bit for the lives and health of others. This should be obvious by now by all the killing, maiming and displacement involving the destruction of whole nations. Who benefits from this? Physicians are pawns still scratching their heads at why they are not being helped. They must help themselves and think long and hard and begin to do, or they and their patients will remain in the same passive compromised mess until the end of time. Why is MOC kept off the agenda in so many states and legislative relief written to favor the status quo of MOC and insurance companies? In benefit of large merged and merging institutions and their associations? Because physicians and politicians are passive, often blind to the facts of corporate greed, and too overburdened to do. Patients are unaware of their compromised healthcare systems. All are being led by industry shills, professional medical politicians and propaganda in order to control agenda and politics. Patients cannot do either. MOC is part of a larger scam that needs to be totally exposed and banned. What part are we as individuals doing to fix the problem. One comment will not do. Organization, clear planning, and massive support is needed. The media is being manipulated as usual to control the flow of information. Dire state of Russian health care (Newsweek 2016). Corrupt administrators and insurers have only made it worse in 2017. Healthcare was bad in the Soviet Union, but many say it was much better and shortages were no as profound. This year-in-review is only a scratch on the surface of corruption involving the ABIM MOC gang and the ABMS. Medical science died when the ABMS became corrupt beyond recognition. 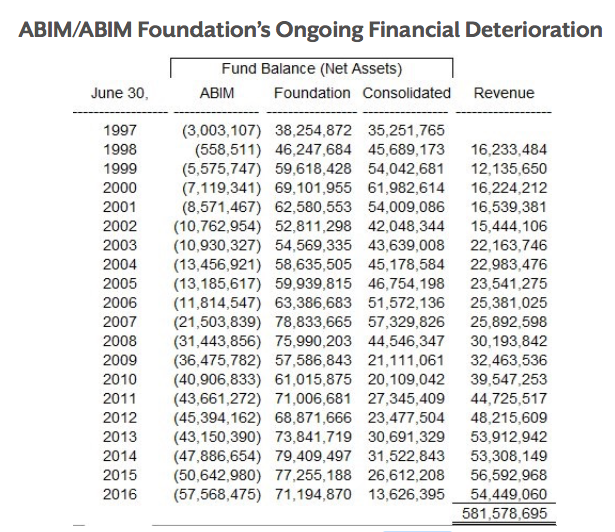 The ABIM became corrupt beyond repair when they trammeled the constitution and bill of rights among hundreds of other things. UpToDate executives and their paid-for physicians became prostitutes for "the industry" when WoltersKluwer bought them out. (UpToDate owns a piece of the testing market now and the question pool. Who controls WoltersKluwer? ABIM, ACGME and ABMS, corrupt beyond fixing, now fixes 'the games' for the healthcare industry and their business partners such as Pearson PLC, WoltersKluwer, Elsevier, big pharma, the major insurers, and their paid lobbyists in DC and elsewhere around the globe. The AMA and ACP, parent organiztions of the ABIM/ABMS, helps by pulling the political strings, providing lucrative executive jobs for 'political revolvers' and direct funding. They publish propaganda along with their friends at the NEJM. All are in the lucrative business of quality assurance, political control and data collection. They all keep files on physicians denying them the right to privacy, the right to be left out of their highly commercialized/profitable profiles. Physicians do not have, nor can they exercise such rights as privacy or "the right to be forgotten". The ABMS does NOTHING to protect its Board Certified physicians from state medical boards, DEA, law enforcement from using ANY doctor as a medical expert. For example, the MBC, DEA and several law enforcement agencies use Dr. Tim Munzing (Anaheim, CA) who has absolutely zero formal pain management/pain medicine training as a "medical expert" in pain management related criminal cases.